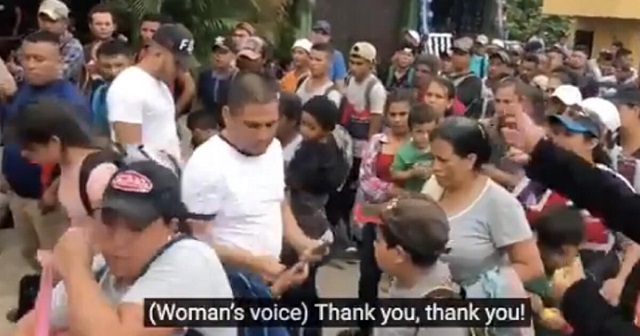 Gaetz: Video Shows Cash Being Handed Out to Migrant Caravan Headed For U.S.
Florida Republican Representative Matt Gaetz shared video on Wednesday allegedly showing cash being handed out to members of the 4000-strong migrant caravan making its way to the US that's getting bigger by the day. "BREAKING: Footage in Honduras giving cash 2 women & children 2 join the caravan & storm the US border @ election time. Soros? US-backed NGOs? Time to investigate the source!" Gaetz tweeted. Who is funding the migrant “caravan”? Each migrant’s passage can cost as much as $7K each. Per capita income Honduras is $2.3 K.
Who is paying for this Central American caravan of 3,000 people so they can attack American sovereignty?if this caravan succeeds how big will the next one be? Why do news media and the Democrats favor law breakers? Our immigration laws are so weak we literally can't just stop these illegal invaders at the border and send them back, but instead need to let them all in so they can file for asylum with the aid of Soros-funded lawyers! The midterms need to be a referendum on this insanity! UPDATE II: Gaetz clarified on Thursday that the video was shot in Guatemala and not Honduras.